Serving as a home to kings, rulers, and emperors, each castle has its own unique style and architecture which expresses its owner’s personal taste. We’ve picked for you these 4 extraordinary castles and forts around Asia which will definitely make your jaw drop. It would be a crime not to mention India’s most famous castle and winner of the new 7 wonders of the world – the Taj Mahal. So once we got this one off the table, we’d like to give the stage to a somewhat different, but not less attractive wonder from Asia. When walking in the noisy and busy streets of Delhi, one might pass this magnificent giant and not even notice. Hiding beneath the dusty mist of India’s most hectic city, you’ll find the Red Fort. This ancient castle used to be home to the emperors of the Mughal empire, up until the Indian Rebellion of 1857. It will only take you a single look to guess the fort’s name origin, because the fort’s exterior is made entirely out of deep rusty-colored sandstone bricks. If we had to guess where Disney’s art directors took inspiration from for their dreamy castle illustrations, we’d point our finger at this gem. 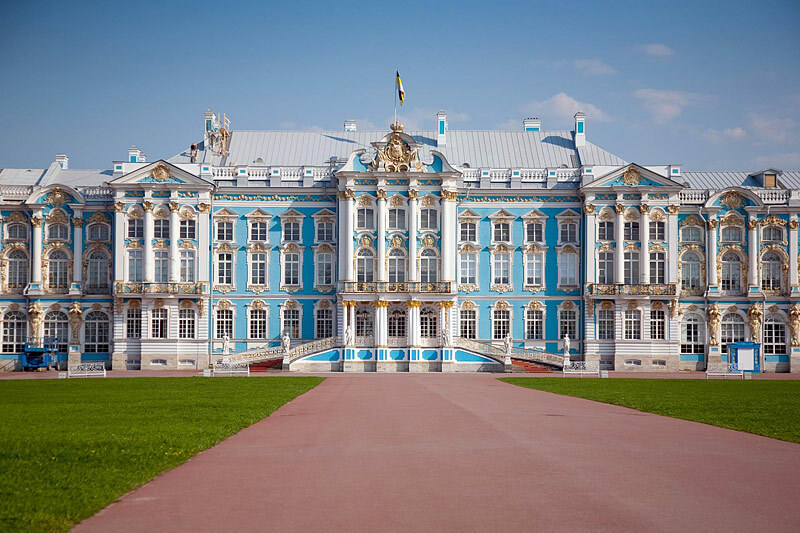 Located 30 km away from Russia’s 2nd largest city St. Petersburg, the palace was actually built by a European – a German architect which was hired by the Russian Tsar. The amount of effort and budget that was put into this project is just unbelievable. The construction of the building’s façade and decorations required more than 100 kilograms of pure gold, and the total expenses on the castle were as high as one million six hundred thousand rubles (about 27,000$) – a great sum of money for that time. During WWII the Germans destroyed much of the castle’s interior, which was then reconstructed in 2003. This stunning castle is so sparkling white, it’ll make your eyes hurt. Wat Rong Khun is a Buddhist temple, which was reconstructed by Chalermchai Kositpipat, a local artist from Chiang Rai. This artist invested over a million dollars from his own pocket in order to make the place a center for Buddhist teachings. 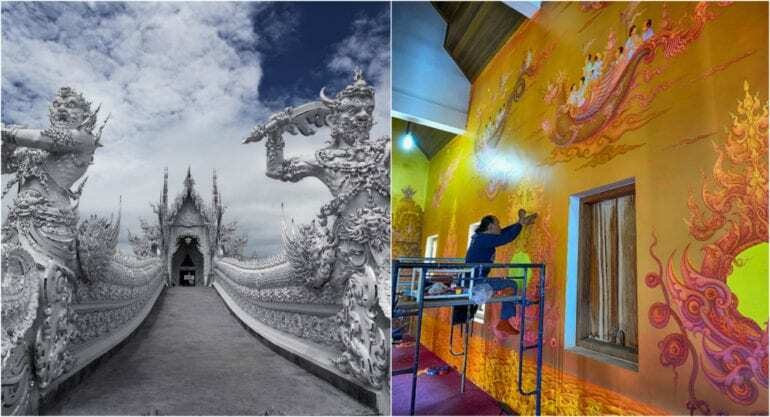 At first, the castle might seem like just a simple, all-white classic Thai temple, but if you take a look inside, there’s a BIG surprise waiting for you. The interior carries no resemblance to what you’ve just seen. Its colorful diversity has a little bit of everything to offer, but the most unusual part is the sculptures and images of modern western icons. You can find Harry Potter, Michael Jackson, Superman and even Kung Fu Panda tied together and blending into the Thai symbols and architecture. If you thought your childhood’s sand castles were nifty, well, you weren’t even close. Take a close look at this picture, and prepare yourself for a small shock. 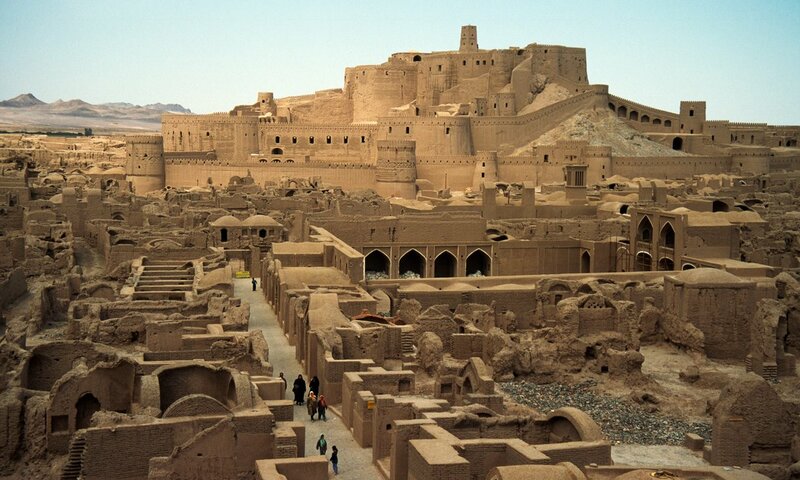 Yes, this enormous castle was built completely and only out of… MUD! Holding the title of the world’s biggest adobe, Arge-e Bam is over 180,000 square meters and has 4 entrance gates, 38 watchtowers and its stables can hold 200 horses (if you can actually manage to find that many horses). In 2003 an earthquake struck the area and destroyed most of the buildings. It was surprising to see how after holding up against weather and wars for centuries, a single earthquake had caused so much damage. Today, major reconstruction work is still being held at the site in order to restore it to its original glory.